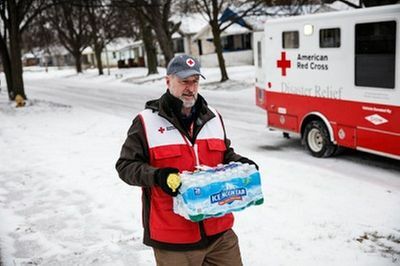 Everything the American Red Cross does is powered by the commitment of our volunteers, and the generosity of the public and our corporate partners. As a member of our Disaster Responder program, HPE’s impactful support helps to ensure we stand ready to respond—whenever and wherever we are needed. In the U.S., the American Red Cross helps communities prepare for and respond to disasters, teaches people health and safety skills like CPR and first aid, and provides emergency connections and services to the members of our military, veterans and their families. We also supply over 40% of the nation’s blood supply by collecting, manufacturing and distributing lifesaving blood products to patients in need. From a global standpoint, the International Red Cross/Red Crescent Movement is active in 190 different countries around the world. The American Red Cross partners with our sister national societies in a number of different areas—including measles vaccination campaigns, disaster response and preparedness education, and connecting families who have been separated by conflict or disaster. Volunteers are absolutely critical to the work of the Red Cross/Red Crescent Movement. In fact, around the world, more than 17 million people are actively engaged as volunteers with various Red Cross Red Crescent national societies. In total the American Red Cross has nearly 330,000 volunteers in our ranks, and on any given day we have tens of thousands of volunteers actively working to deliver our vital services. These individuals are true humanitarians. They see a need, and they are committed to working to fill it—often spending weeks at a time away from their friends and family to provide comfort and hope to others in need. They respond to calls in the middle of the night to come to the scene of a home fire, give comfort to impacted families, and make sure they have a safe place to stay. They install smoke alarms in vulnerable homes during community events. They staff our shelters, and distribute vital food and relief supplies to affected people during natural disasters like the recent flooding in Louisiana and Hurricane Matthew. They work in military and veterans hospitals, providing comfort items and emotional support to injured service members and veterans. They serve as ambassadors at our blood drives to help make our selfless blood donors feel welcomed and appreciated. They often help to train others in vital health and safety lessons like CPR, first aid and water safety. The need is constant, and if you’re interested in engaging in our lifesaving mission I would encourage you to explore volunteer opportunities available in your community at www.redcross.org. On behalf of those we serve, thanks once again to HPE and its employees for standing with the American Red Cross. Want to find out more? Listen to this HPE Gives Podcast in which Gail speaks passionately about the critical role volunteers play in the American Red Cross and the International Red Crescent movement.